Pumpkin Pie Baked Oatmeal. I love oats for breakfast. They fill me up and give me lots of energy. I often make my overnight oats in a jar. This baked oatmeal is another way to eat your oats on the go. If you like my pumpkin pie overnight oats, you will love this recipe! 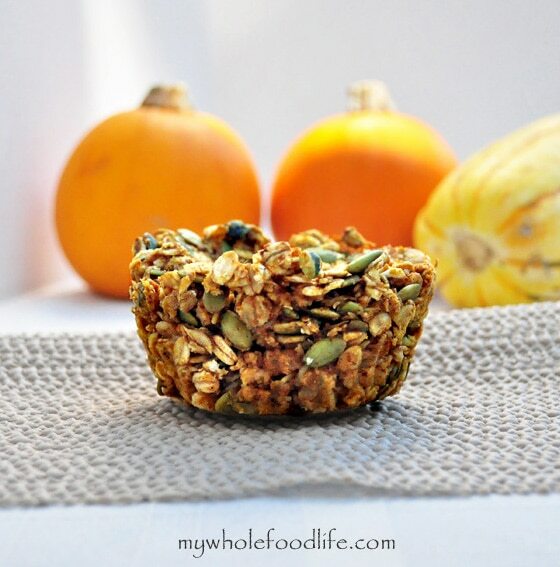 This pumpkin baked oatmeal recipe can be made in just about 30 minutes. Very easy and you may already have most of the ingredients! It’s like a bowl of oats in muffin form. Great for on the go. You can make a big batch and freeze some for easy breakfast options on those busy days. Want to make this recipe? You can view the video below. For more videos, please subscribe to my You Tube Channel. Mix all the dry ingredients in one bowl. Mix wet into another. Add wet to dry and mix until combined. Spoon batter into lined muffin pans. I used a jumbo muffin pan and got five out of my batch. You could probably get 12 with standard muffin pan . These freeze well too. Enjoy!